Today I picked my crew up and went looking for Stripers. It didn't take too long before I found a smaller school which was good to set up on. We hit it and popped a couple keepers before loosing it. 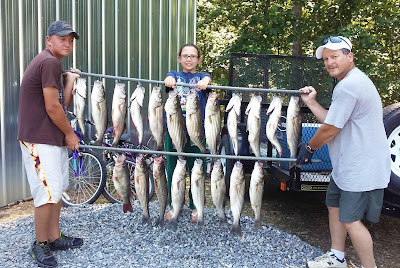 We got back on the motor and found some more, and more, and more. 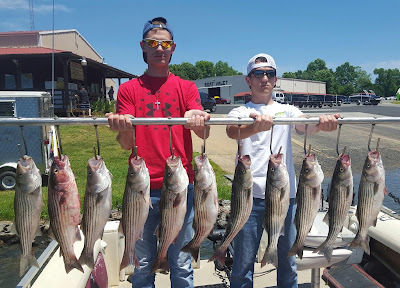 Today was just a half day charter and that's all wen needed to catch some nice limits. 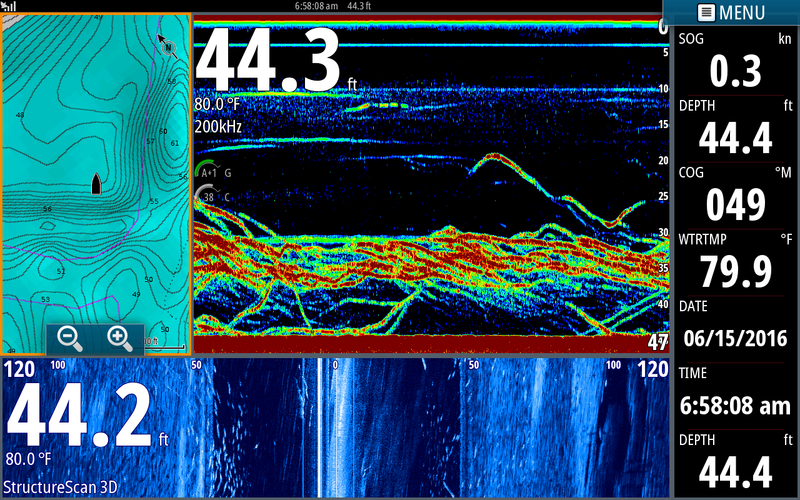 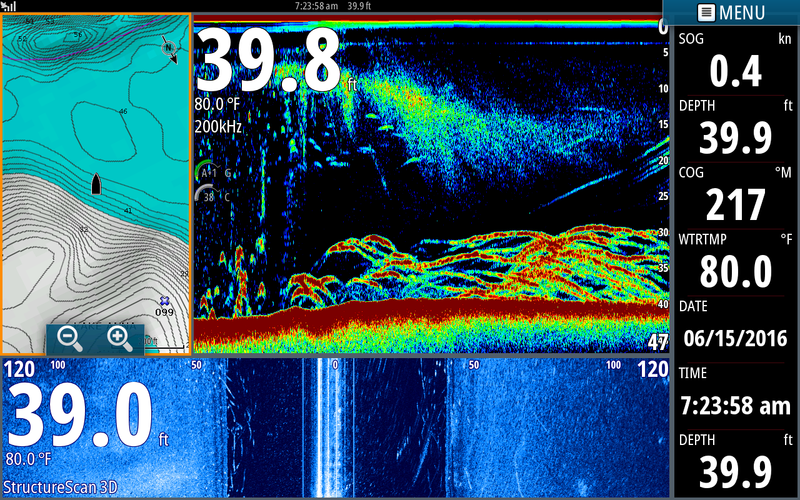 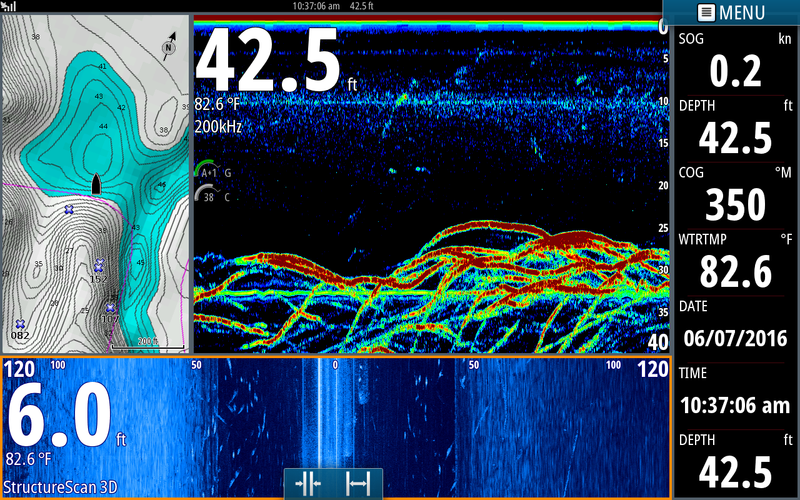 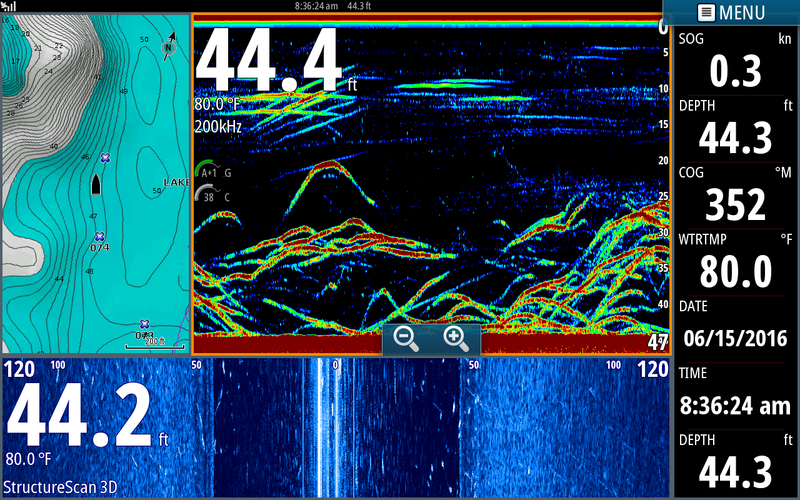 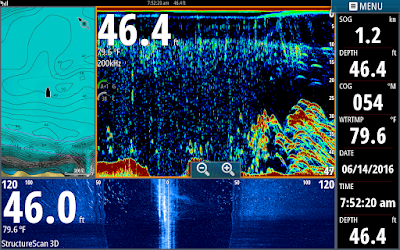 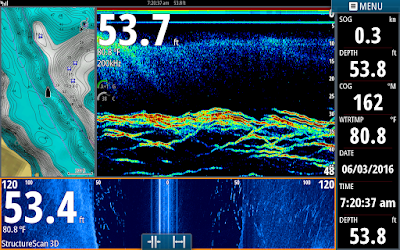 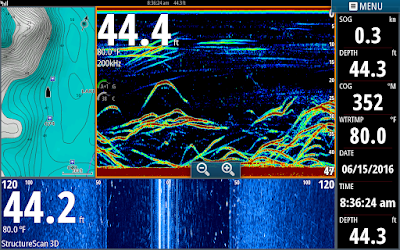 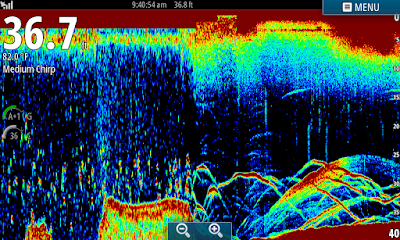 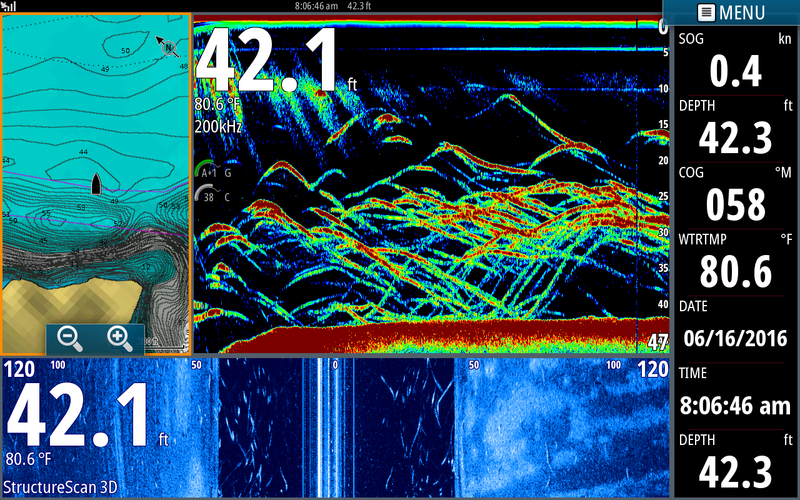 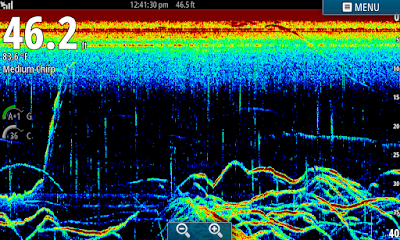 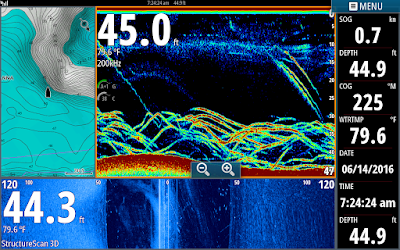 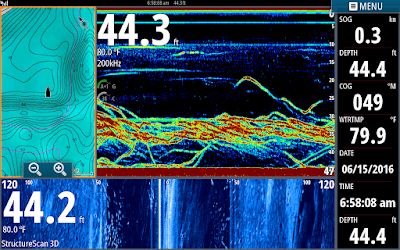 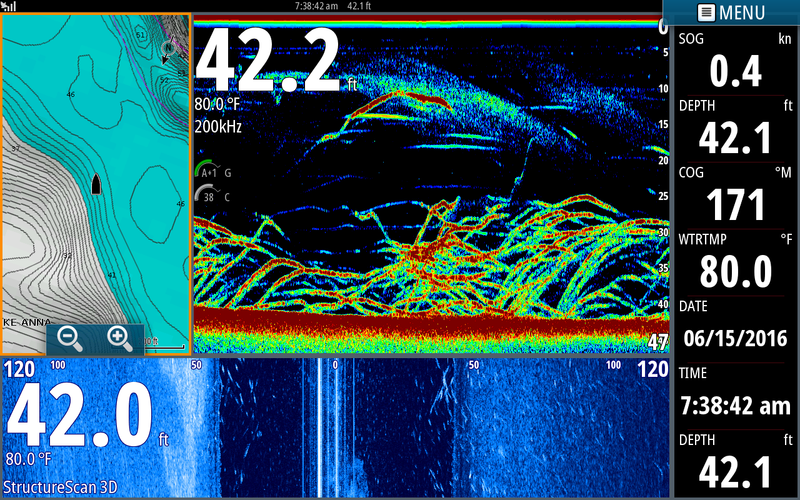 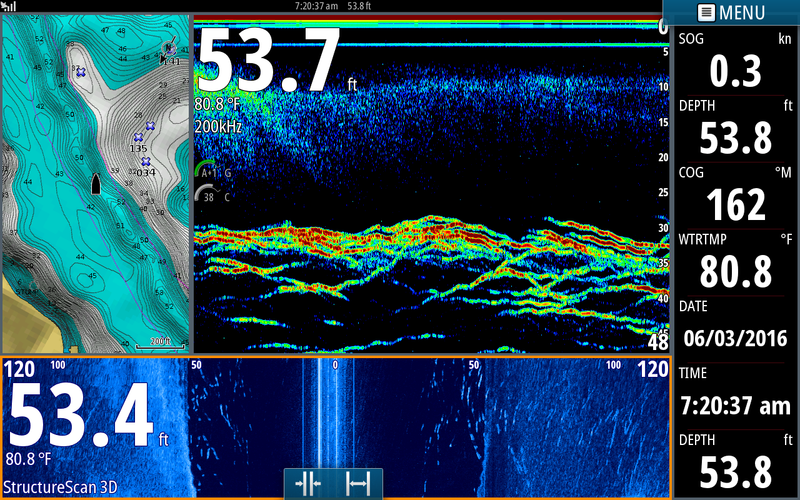 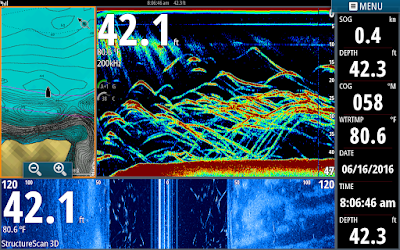 Not only did Ron catch a bunch of fish today he also learned how to use his new Simrad. 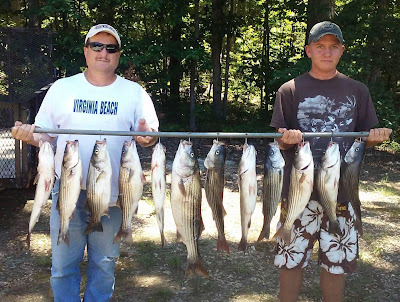 Today was another fun morning on the water catching Stripers. 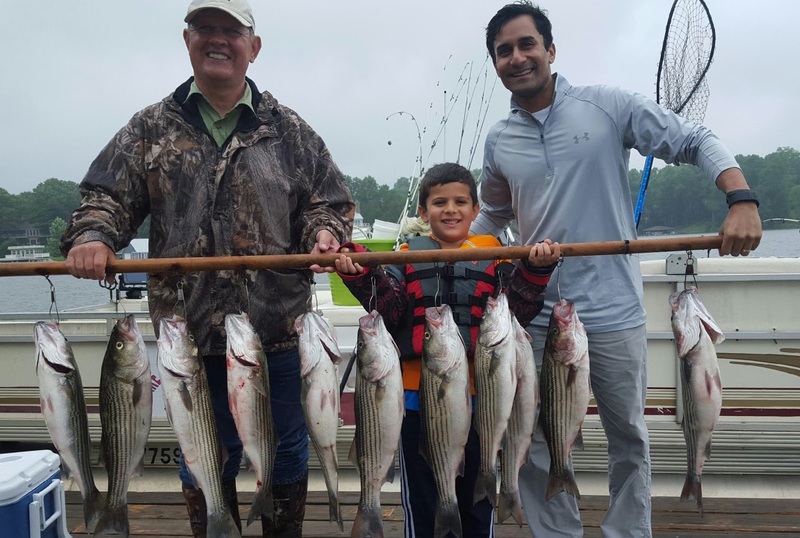 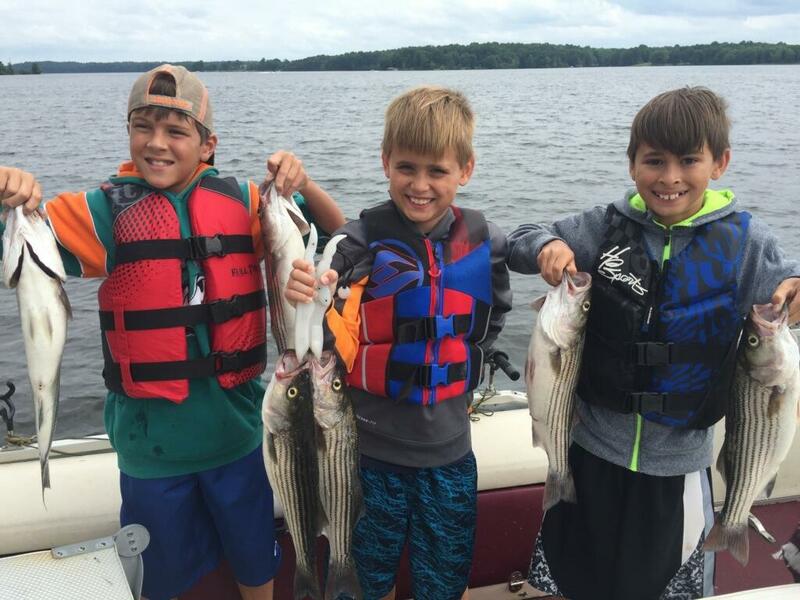 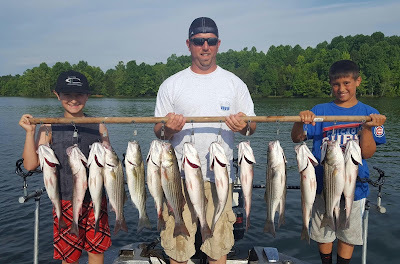 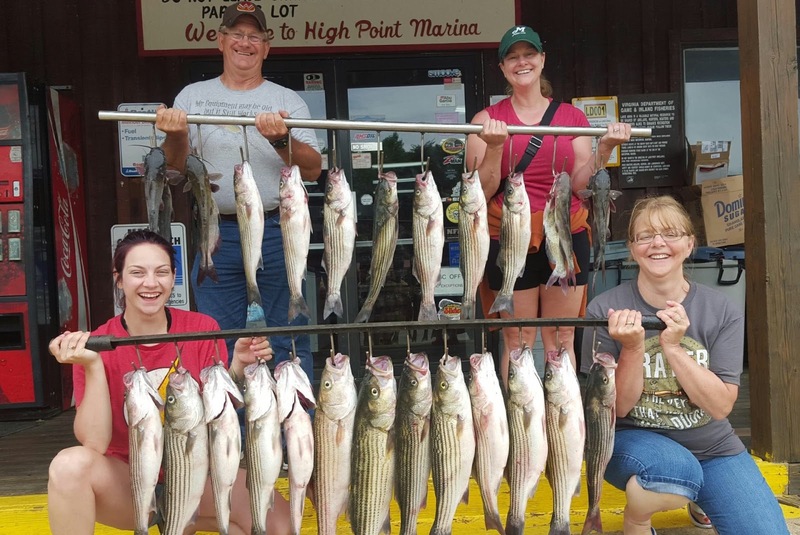 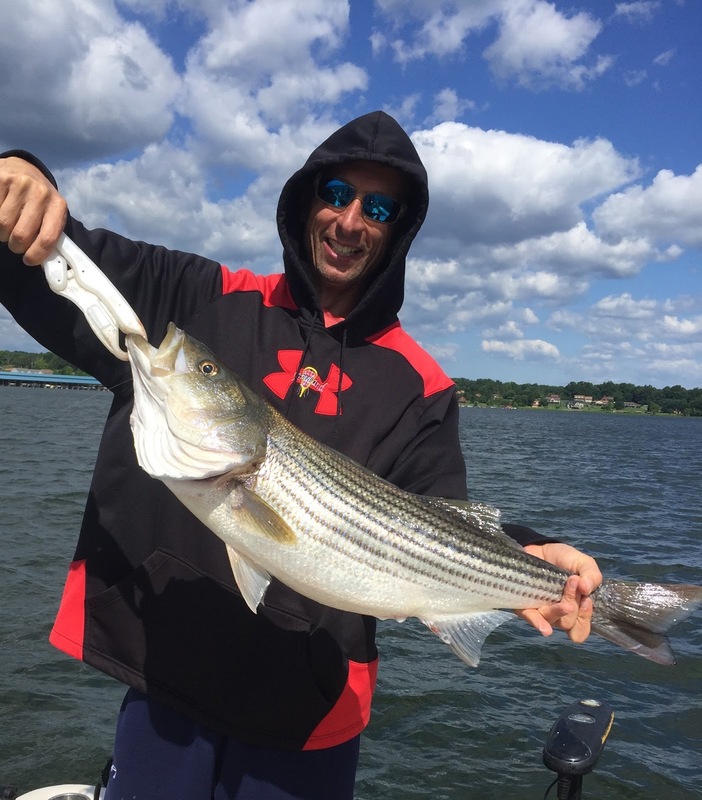 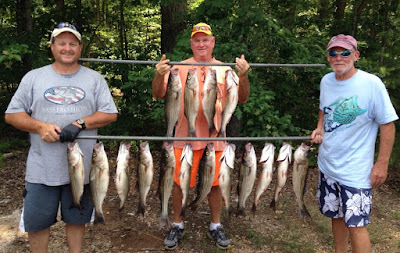 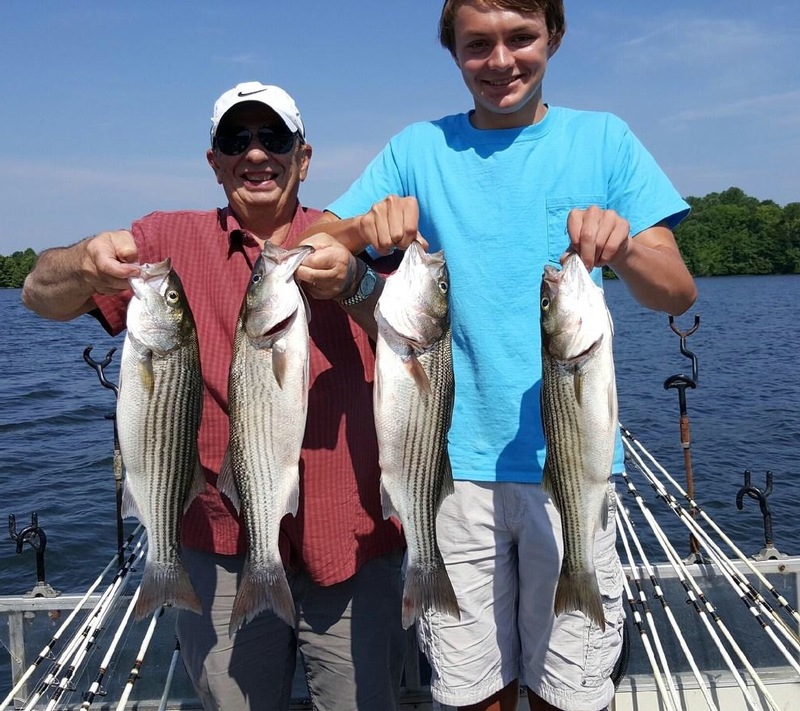 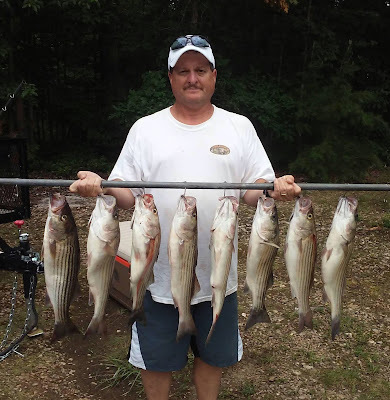 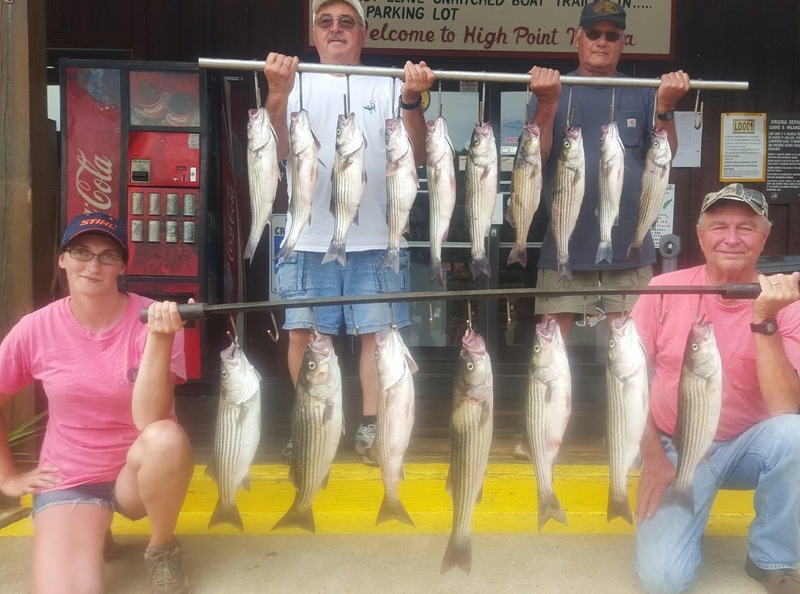 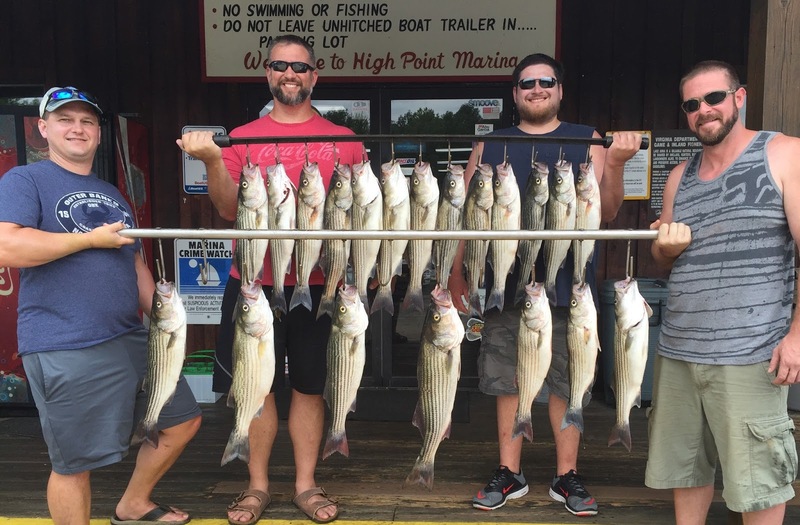 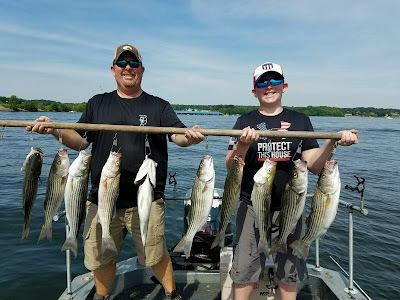 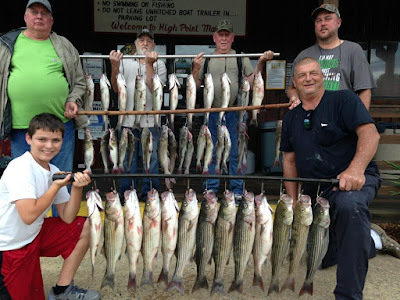 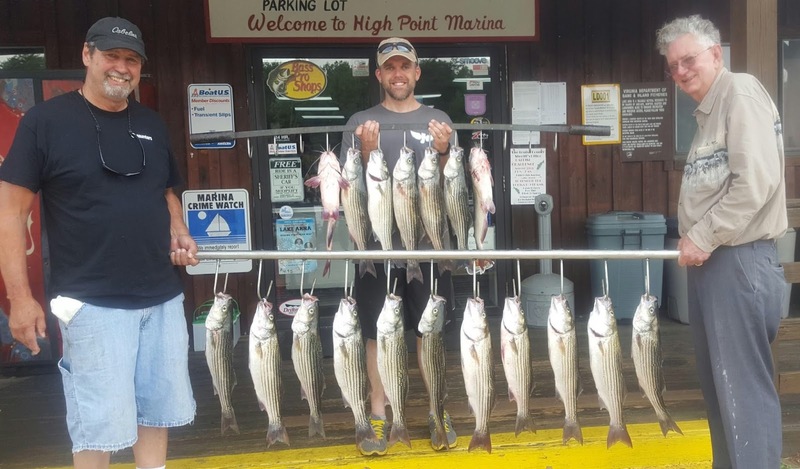 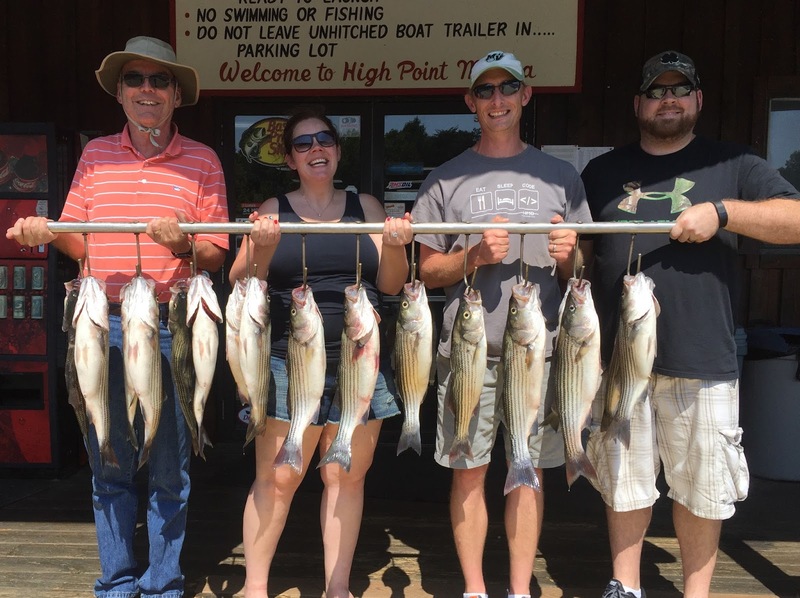 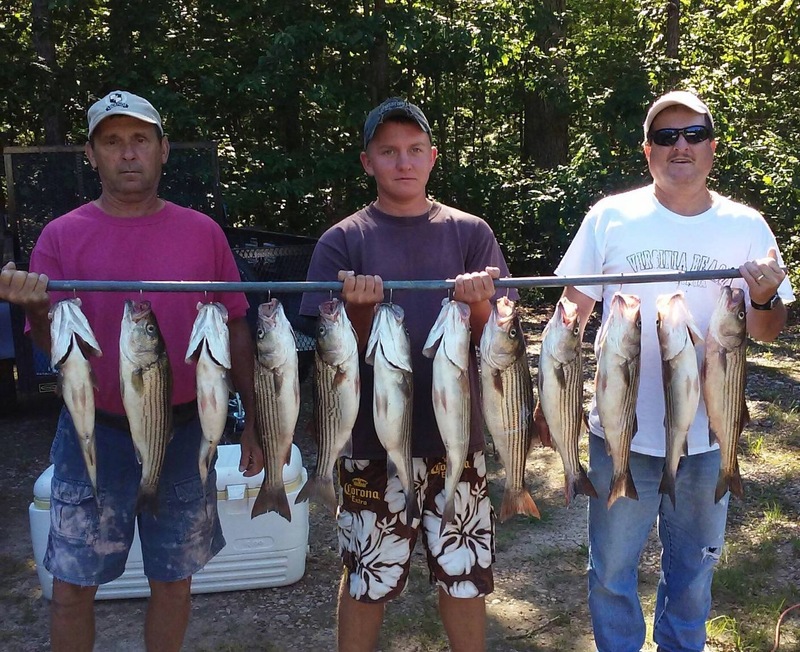 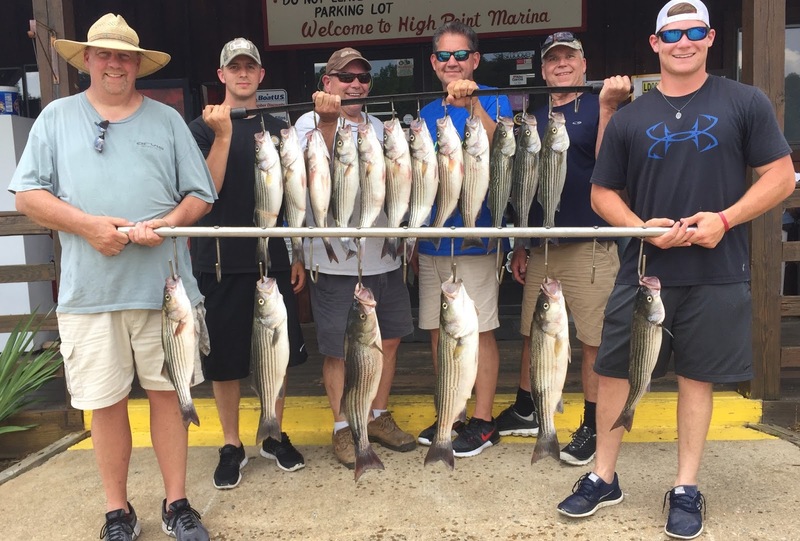 Mike and his family are down visiting the lake and were able to get out and catch enough Stripers to feed all of his group for the rest of the week. 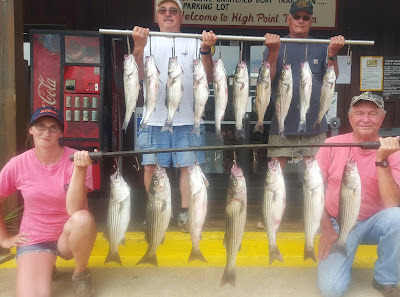 Don put Vanessa, Donna and Bubba on these nice stripers this morning. 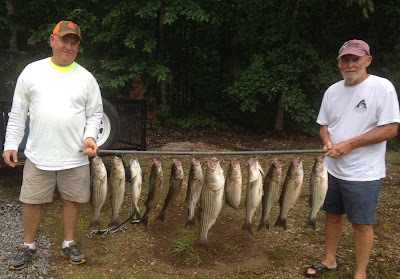 Here is one of the nice schools we worked today. 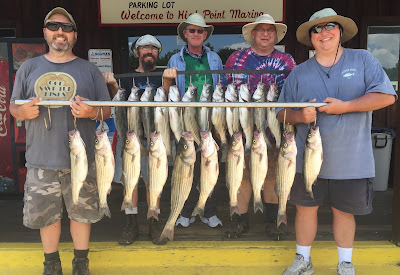 This morning I pulled out of the marina and went about 200 yards and hit our first school of Stripers. I hadn't even showed the guys how to deploy the lined but we managed to catch a few out of the school before we lost them. Today fishing was tougher than usual, we had to work hard for the fish we caught. 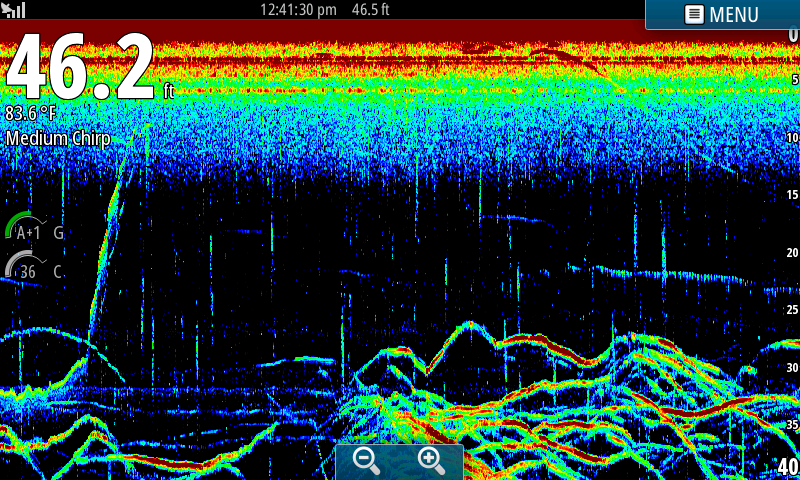 We found 4 or 5 schools but they moved very fast today. 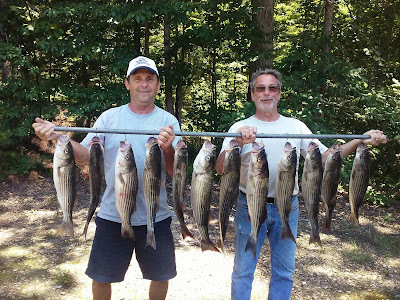 Tony took these guys out this morning on a very windy day. 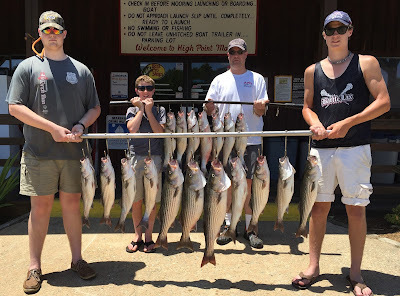 They fished between the whitecaps and managed a nice limit of Stripers, quite an accomplishment for 25 to 30 mph winds. 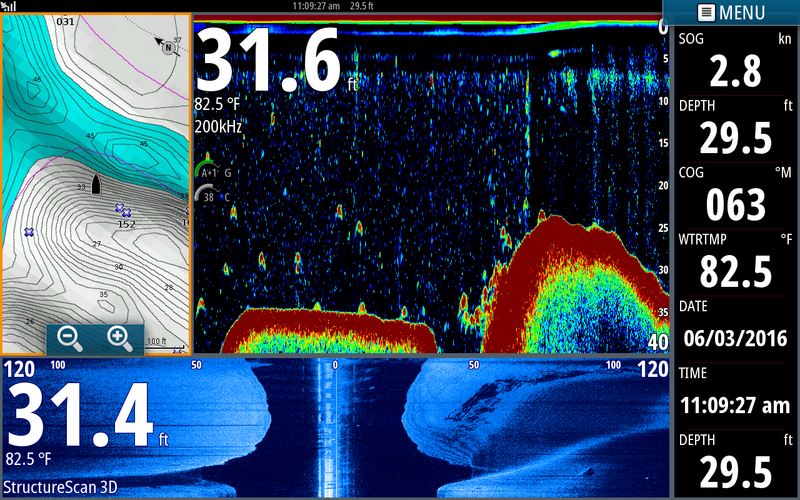 Unfortunately the fish are out in the main lake where you can not escape the wind. Sunny and Warm, Water Temperature 82 * and clear. 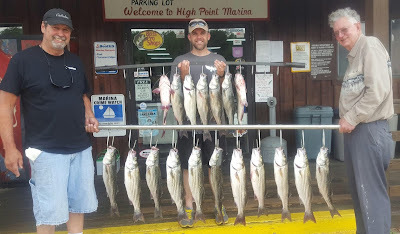 This morning I picked my clients up at 5:30 and less than 10 minutes later I was setting over a school of Stripers. Today we went through 235 baits running from school to school banging Stripers. There was so much confusion on the boat I did not even attempt to keep track of how many fish we caught today. 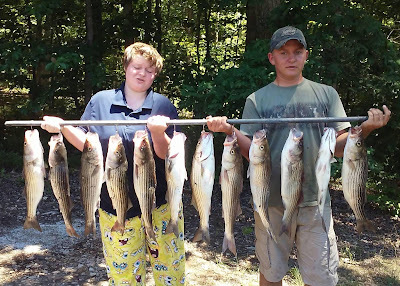 Regardless they took their limits home. Glad to get that Monkey off of Bob's back today. 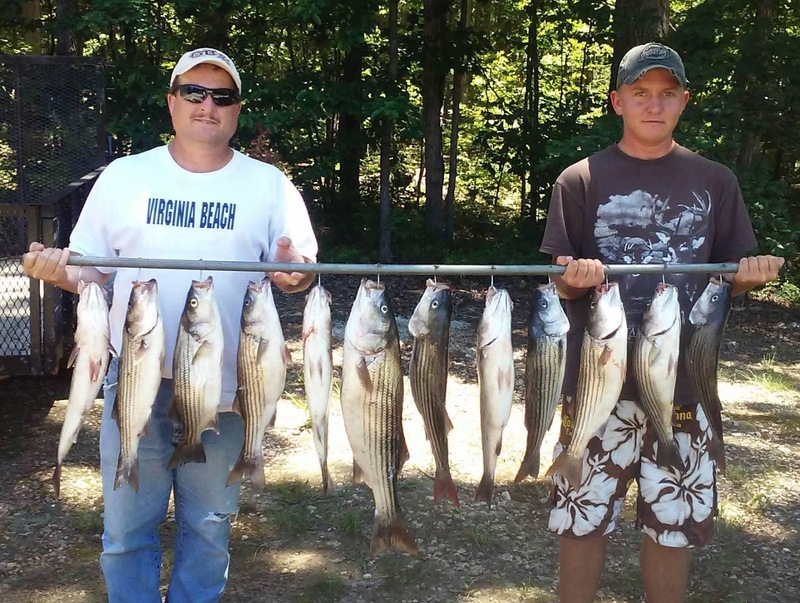 these guys on a bunch of Stripers. 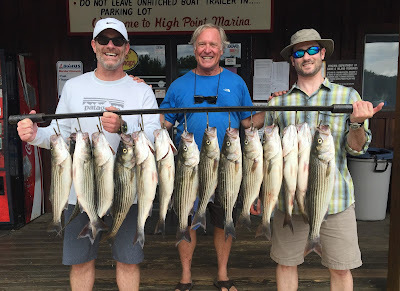 This morning I caught bait and picked up Jim and his friends at High Point at 5:30. 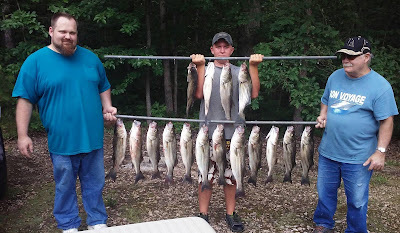 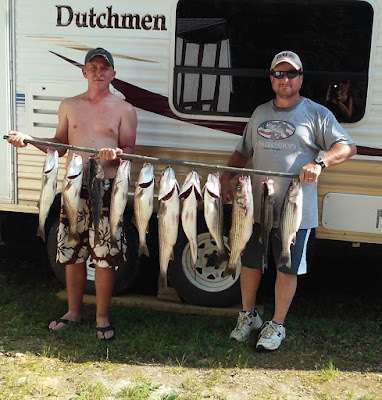 We went away from the crowds and put out a spread and started catching fish immediately. 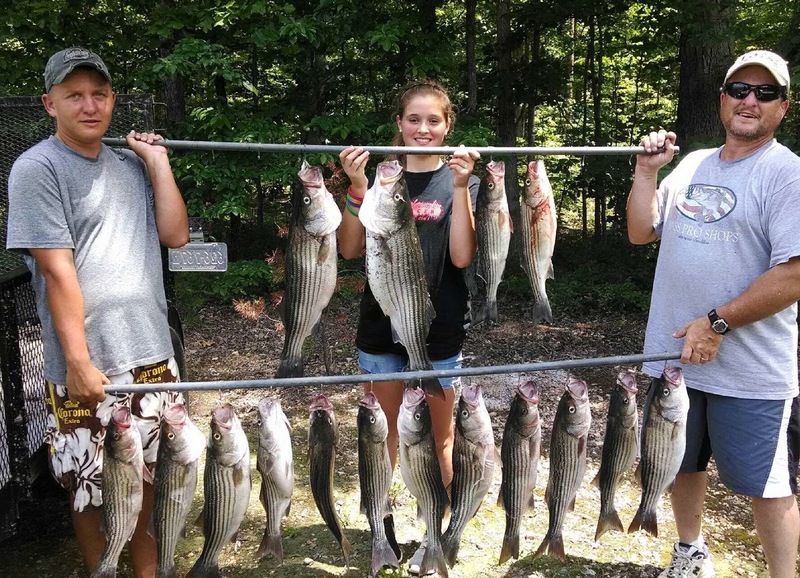 After 30 minutes we started looking for schools and found them within 5 minutes. 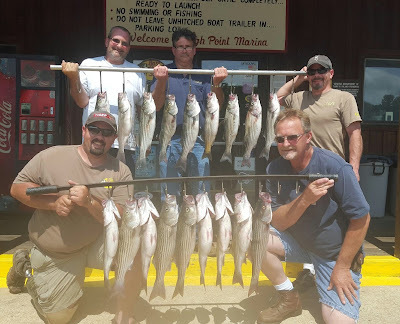 We worked on them until Zeke lost a hummer then it was over. 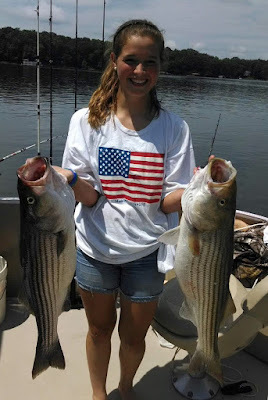 We located another school about 300 yards away and worked on them. 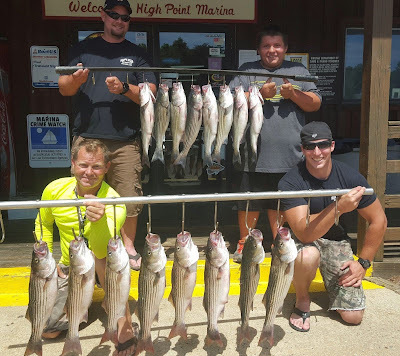 After awhile we needed a break so I stopped by the marina then went out and hit school after school. 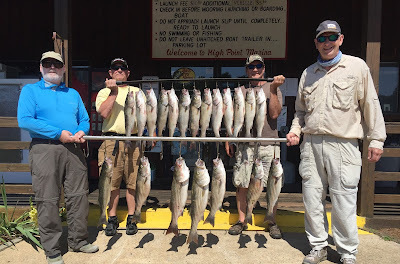 It was a fun morning on the water with some fun friends. This is just the beginning of a great summer bite. 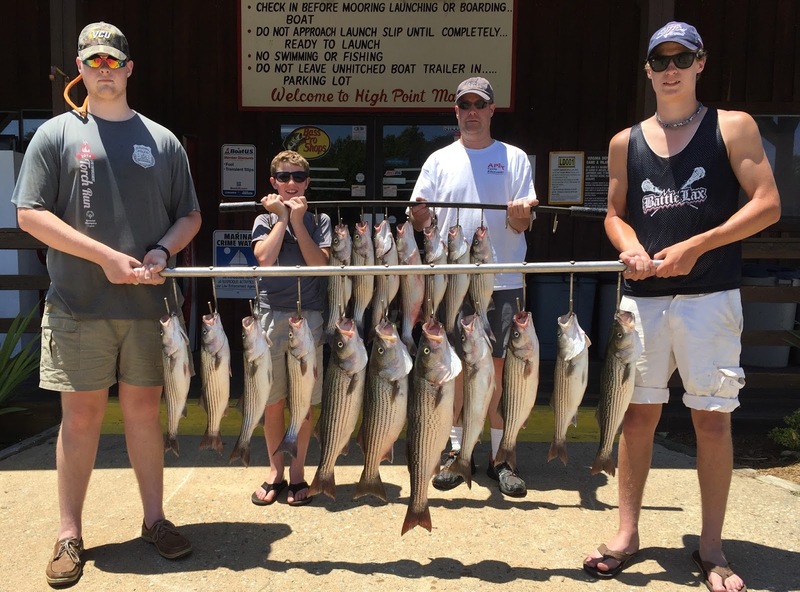 Better get out and get you some, VDIGF has done a wonderful job of managing the lake and Stripers are plentiful.